This is a place called Pukara - it's the Wanampi place. That's the man snake, the black one. His wife is the smaller one, the orange snake. It's their place, their story, those two. This country is full of Kaliny-Kalinypa or Honey Grevillea- sweet, yellow one. It's everywhere. The sandhills are the orange lines and the green and yellow lines. There are trees and rockholes. It's a dangerous place this one but beautiful too. The snake is thinking, he's looking around and saying "these are all my colours, everything in this country". Ginger and Kunmanara (Iyawi) Wikilyiri are husband and wife from Nyapari Community where they paint at Tjungu Palya art centre. Ginger was born at Kunamata a rock hole south of Nyapari in 1930. His father had three wives. Wingu Tingima is the daughter of the first wife and Ginger the son of the second. Ginger is a senior law man and has cultural responsibilities for both Kunumata and Piltati. His passion for land management has taken him to Israel to learn about arid land techniques and to Mutitjulu, where he worked as a ranger for the Uluru-Kata Tjuta National Park. 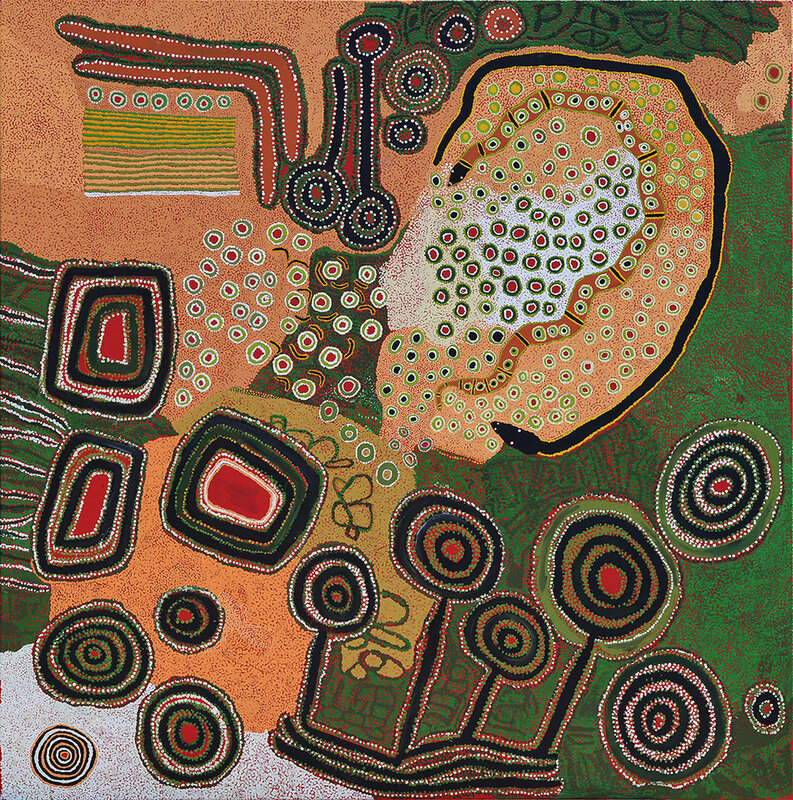 Ginger’s expressive and vibrantly coloured works embody a wealth of traditional knowledge. Kunmanara attended the mission school at Ernabella before finding employment in the craft room. Her vibrantly coloured works represent a spiritual dimension that is not confined to the past, but is still active between the land, plants, animals, the people and ancestral beings. She passed away in September 2016.